Kinect Sports: Season One is an entertaining, if not terribly deep, game. Among the things that I appreciate about the game is the inclusion of “World Records” in all of the track and field events. There’s five track and field events, and pretty much the first time you successfully complete one of them, you’re going to break the world record. You get a little bit of extra applause from the crowd, a dramatic replay set to the epic Chariots of Fire theme, and a short chance to bask in the glory of your easily-earned success. It’s no secret that achievements are a huge part of games these days. Heck, even Microsoft’s Visual Studio is introducing achievements. But I thought this was an interesting way for first-time players to get a (relatively) big rush out of winning a track and field event. I know I’ve appreciated all the chances to practice my victory celebrations as I break low-set default world records in the various events. And for first-time players, an outstanding first time experience will make all the rest better. Everybody loves a quick win. 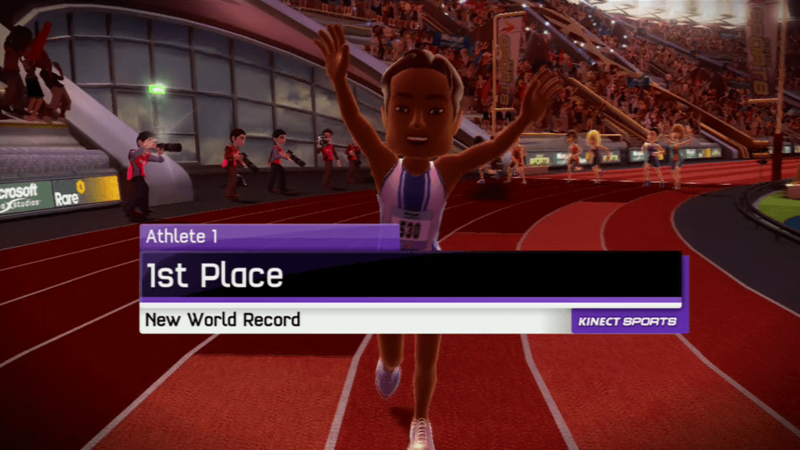 This entry was posted in Casual, Console, review and tagged breaking records, casual games, chariots of fire, first time users, gui, kinect sports, noobs, track and field, ui, ux, world records, xbox 360 by mark d. Bookmark the permalink.